Yawkey Way, outside Fenway Park, was named for the late, former Boston Red Sox owner, Tom Yawkey, who was known for his philanthropy, but also for what was a racist ball club. 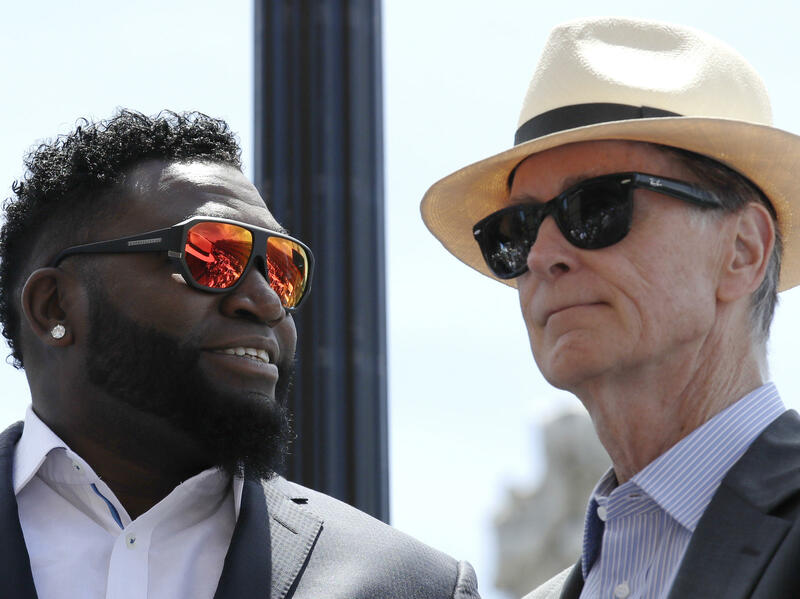 Retired Boston Red Sox designated hitter David Ortiz, left, stands with team principal owner John Henry while honored with the renaming of a portion of Yawkey Way to David Ortiz Drive outside Fenway Park in Boston on June 22, 2017. Henry says he wants to rename all of Yawkey Way, a street that has been an enduring reminder of the franchise's complicated racial past. 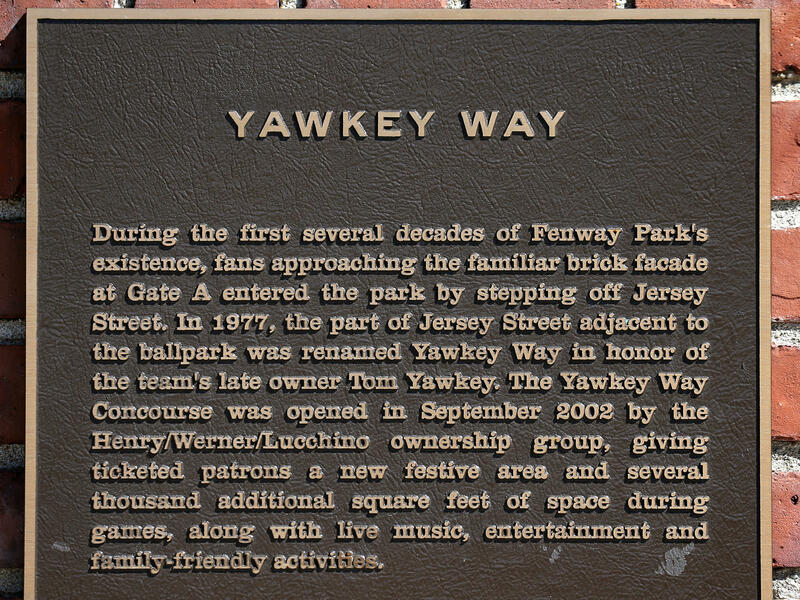 A plaque describing Yawkey Way is pictured on the side of Fenway Park. The street pays homage to former Red Sox owner Tom Yawkey, who kept his team all-white longer than anyone else, passing up chances to hire future Hall of Famers Jackie Robinson and Willie Mays along the way. 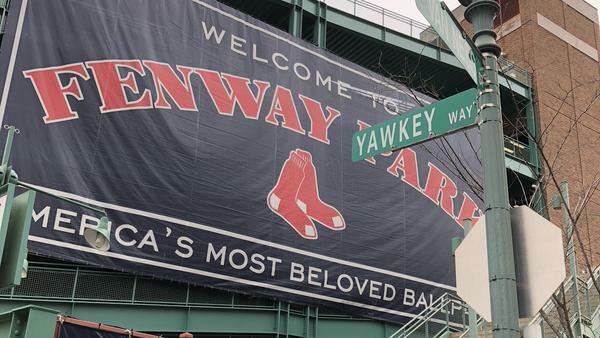 The team's current owners have said they're still haunted by Yawkey's legacy, and they asked for the street to be renamed to distance themselves from the team's checkered past. The Yawkey Foundations, which advocated keeping the name, called Thursday a "sad day" and said the effort to change the name "has been based on a false narrative about his life." "Tom Yawkey deserved to have his name live on at Fenway Park," a statement from the Yawkey Foundations read. "We can't change today's decision, but we remain hopeful that he will be remembered as the good and decent man he truly was." The Red Sox were the very last team in the majors to integrate, only finally hiring a black player, Elijah Jerry "Pumpsie" Green, in 1959 — 12 years after Jackie Robinson broke the color barrier with the Brooklyn Dodgers. The Sox front office was notorious for racism, even spewing the n-word, as many fans were reputed to do as well. The ugly history made it all the more painful last summer at Fenway, when Orioles center fielder Adam Jones said a Sox fan hurled the n-word at him, along with a bag of peanuts. The incident triggered an apologetic scramble from the current Sox owners, who said they were sickened by the behavior. The team lost no time ejecting the guilty fan, banning him for life, and reiterating that the Sox have zero tolerance for any such intolerance. Shortly after, as if to underscore their commitment to inclusion and hoping to finally shake off their sordid past, the Sox began a campaign to strip Yawkey's name from the street they call Fenway's "front door." "The undeniable and regrettable history of the Red Sox make it difficult to continue to give prominence to a symbol associated with an era marred by racial discrimination ," said Red Sox attorney David Friedman, at the start of a recent hearing before Boston's Public Improvement Commission. The panel, used to much more subdued hearings on street signs and utility poles, got a roomful and an earful about Yawkey Way. "It is a disgrace," boomed Walter Carrington, a former U.S. ambassador, who once headed up a state investigation into alleged discrimination by the Red Sox organization. Calling Yawkey Way "Massachusetts' confederate statue," he said, "Every time I — or any black — go into Fenway Park, it's an insult." In 1959, when Carrington was head of the Massachusetts Commission Against Discrimination, he says the Red Sox organization was rife with bias in its hiring of players — and staff. Carrington's investigation included interviews with Red Sox players, and with Jackie Robinson, who had been passed over by the Red Sox after a tryout widely believed to have been a sham. By the end, Carrington came out agreeing with Robinson. "[Robinson] said then to me, as he has said publicly, that he believed that Tom Yawkey was the biggest bigot in professional baseball," Carrington recalled. But the bid to erase Yawkey's name has also rallied his fans, like former Red Sox pitcher Jim Lonborg. He says Yawkey eventually came around to fully embrace the team's black players. "I understand a lot went on early in the history. But I personally saw a change in Mr. Yawkey...when I think he became a better man," Lonborg said, his voice cracking with emotion. "And we were all ... better people because he was in our club house." Yawkey's defense included a long line-up of Bostonians who've been beneficiaries of all the charity that's been given by Yawkey, and his late wife Jean, through their foundation, Yawkey Way 2. The foundation has poured some $300 million into Boston organizations — from The Boys and Girls Clubs, to hospitals, the Jimmy Fund for cancer care and research, food banks, colleges, the Urban League, Museums, youth programs and more. "The Yawkey family and Foundation have helped generations of the least fortunate in this city," said Boston business man and philanthropist Jack Connors. He implored the commission to keep Yawkey Way, saying that changing it would unfairly smear the Yawkeys' name, and complicate the foundation's good work. He also warned the commission against heading down a dangerously slippery slope. "What ever happened to common sense?" he protested. "If we're talking about street signs, who's going to talk about Washington Street, or Jefferson Way, or Madison Place?" The view is shared by other prominent leaders, including some in Boston's African-American community. "It's a very slippery slope and ultimately a very divisive slope," says Rev. Ray Hammond, pastor at the historically black Bethel AME Church in Boston, and a Yawkey Foundations trustee. The street name Yawkey Way is nothing like the Confederate memorials that deserve to be dumped, he says. Yawkey's "sins" don't compare, he says, and must be considered in the context of the era, his personal growth, and his generosity. And he says, one must allow for his redemption. "Let's understand all heroes probably have feet of clay. And let's be honest about those feet of clay, and learn from those feet of clay," he says. And maybe bring even a little level of humility to it ourselves, because when our kids evaluate us, they're going to also find feet of clay." But others are less forgiving. "Redemption starts with someone saying 'I'm sorry'," says State Rep. Byron Rushing, and Yawkey never publically apologized for the sins of his ball club. So, Rushing says, no amount of charity after his death can absolve him. "That doesn't quite do it," Rushing says. "This is not an argument about the Yawkey Foundation. We're talking about the person, not the foundation." 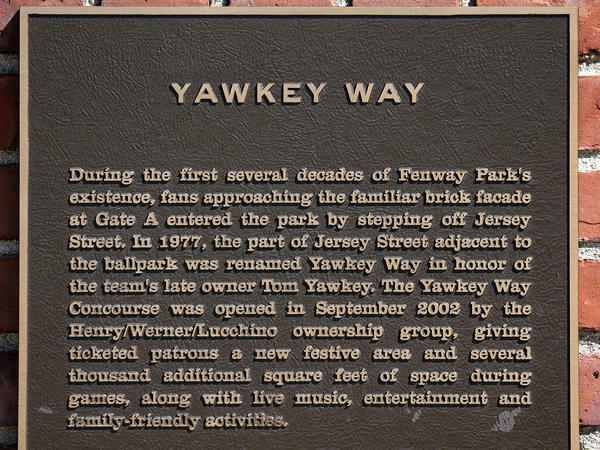 It's why some have suggested a compromise to change the name from "Yawkey Way" to "Yawkey Foundation Way." Outside Fenway fans are mixed on the question. "Ahhh, that's a hard one," sighs 53-year-old construction worker, William Celeste. "You can go both ways on it, because everybody in the world is going to do some bad, so there's no such thing as somebody doing all good, right?" For retired political science professor John Carroll, Yawkey's record makes it not a close call at all. "He was a bigot," Carroll says. "I certainly knew what the score was in the '50s and '60s. They were an out and out racist organization." But others lean more toward a compromise, including some tourists from the South. Shawn Livermore, from Alabama, says "whitewashing history" would hurt more than it helps. He'd rather see the city keep the Yawkey Way street name, but also post a plaque nearby, offering a fuller version of history, and a lesson to learn from. "This knee jerk reaction is to remove it," he says. "But I really feel that's begging for history to repeat itself by not making all those moments teachable moments." Lauren McKone agrees that the Yawkey Way name should stay, even if just out of nostalgia. "It's like a tradition now," the 25-year-old says. "You come to Yawkey Way, and you get sausage on the street before the game. I like Yawkey Way, and it would be weird if it changed from Yawkey Way now." Especially weird, she says to see the street revert to its old name: Jersey Street. As many have noted, that might not be such a great trade for the Red Sox. The Jersey Street name was apparently meant to honor the British Isle of Jersey, where — in a long ago era — local aristocracy boosted their fortunes buying and selling slaves. OK, this has happened to me. I'm driving around, and I turn onto a street with a name like - I don't know - Montague Street, and I wonder, who was that person? Well, in Boston, they know. Yawkey Way honors Tom Yawkey. He was the late owner of the Boston Red Sox, known for philanthropy and - this is the awkward part - also known for running a racist baseball team. Today a commission is voting on a request by the current owners to rename that street outside Fenway Park. Here's NPR's Tovia Smith. TOVIA SMITH, BYLINE: The Red Sox say they're still haunted by Tom Yawkey's legacy. The team was the last to hire a black player - 12 years after Jackie Robinson broke the color barrier. The front office was notorious for racism, even spewing the N-word, and fans did too over the years, even last summer when the Orioles' Adam Jones played at Fenway. ADAM JONES: I heard the N-word, and I just was like, OK, this is really - it's really how it's going to go down here. SMITH: The current Sox owners lost no time kicking the guilty fan out of Fenway for life, saying they were sickened by his behavior. Shortly after, the Sox began their campaign to strip Yawkey's name from the street they call Fenway's front door. DAVID FRIEDMAN: The undeniable and regrettable history of the Red Sox make it difficult to continue to give prominence to a symbol associated with an era marred by racial discrimination. SMITH: Sox attorney David Friedman kicked off a recent hearing on the name change. Then, a former state official, Walter Carrington, called Yawkey Way Massachusetts' Confederate statue. WALTER CARRINGTON: It is a disgrace. Every time I or any black go into Fenway Park, it's an insult. SMITH: In 1959, Carrington investigated the Sox for discrimination and ultimately agreed with Jackie Robinson. CARRINGTON: He believed that Tom Yawkey was the biggest bigot in professional baseball. SMITH: But the bid to erase Yawkey's name has also rallied Yawkey fans like former Sox pitcher Jim Lonborg. JIM LONBORG: I personally saw a change in Mr. Yawkey when I think he became a better man, and we were all better people because he was in our clubhouse. SMITH: Many testified to the good done by Yawkey and his wife, Jean, through their foundation that's poured some $300 million into Boston. SMITH: Boston businessman and philanthropist Jack Connors said the Red Sox are unfairly smearing the Yawkey name and heading down a slippery slope. CONNORS: Whatever happened to common sense? Who's going to talk about Washington Street or Jefferson Way? SMITH: But the debate is not just split along racial lines. RAY HAMMOND: We got serious issues to deal with in Boston, and changing street signs isn't going to get us there. SMITH: Reverend Ray Hammond is pastor at an historically black church in Boston and a Yawkey Foundation trustee. Unlike the Confederates, who don't deserve statues, he says, Yawkey's lesser sins, his growth and generosity should allow for his redemption. HAMMOND: Let's understand all of our heroes probably have feet of clay, and let's learn from those feet of clay. BYRON RUSHING: Redemption starts with someone saying, I'm sorry. SMITH: But Yawkey never did, says state Representative Byron Rushing, so no amount of charity after his death can absolve him. RUSHING: This is not an argument about the Yawkey Foundation. We're talking about person and not the foundation. SMITH: It's why some have suggested a compromise to rename Yawkey Way, Yawkey Foundation Way. UNIDENTIFIED PERSON #4: (Singing) At the old ballgame. SMITH: Outside Fenway during a ballpark tour, another idea from fans like Shawn Livermore from Alabama is to keep Yawkey Way, but also post a plaque with a fuller history. SHAWN LIVERMORE: This knee-jerk reaction is just begging for history to repeat itself by not making all those moments teachable moments. SMITH: Twenty-five-year-old Lauren McKone agrees Yawkey Way should stay. LAUREN MCKONE: It's, like, tradition now, you know? You come to Yawkey Way, and you get your sausage on the street before the game, and it would be weird if it changed from Yawkey Way now. SMITH: Especially weird, she says, if it reverted to its old name, Jersey Street. As many note, that was meant to honor the British isle of Jersey, where locals boosted their fortunes buying and selling slaves. Tovia Smith, NPR News, Boston. Transcript provided by NPR, Copyright NPR.